"Over the last month, I've been working on a new app. 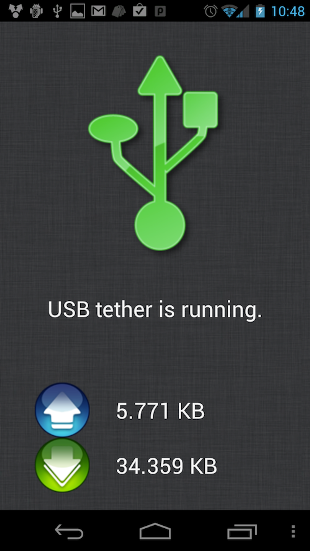 Tether Alpha is a USB tether solution for Mac, Windows, and Linux that allows you to use your phone's data connection to get internet access on your desktop or laptop." Back in 2003, I could tether my Dell Axim to my i-Mate Pocket PC without any issue, in fact it was all done over Bluetooth DUN and didn't even require me to press anything on the Pocket PC - it could stay in my bag while I worked with the Axim. It seems that since then, data speeds have gone up (thankfully) but ease of use has gone way down. Now that carriers care about data usage (despite trying to get us to use as much as possible), solutions like Koush's appear, promising to let us tether without it showing up to our carrier. Intriguing times we live in!